Chole Masala Recipes, Indian Chole Masala Recipes. Chole masala is a blend of certain spices that are used in the preparation of a world famous Punjabi dish made with kabuli chana (chickpeas) called Chole. There is no exact recipe of Chole masala as it varies from family to family depending on how they like it but the basic ingredients remain the same. The dry spices that are usually used in the preparation of this masala are bay leaves, cumin seeds, coriander seeds, cloves, star anise and a few others. What makes this masala different from other Indian spice blends is the presence of anaardana (dried pomegranate seeds) for a pleasant sour taste. First and foremost chole masala is used to make the delicious Chole Bhature. Apart from the masala itself, this recipe requires different aromatics and flavors like onions, ginger, garlic and dried mango powder. This recipe can be served alongside piping hot bhature, which is a big, fluffy puri or even parathas. Generally chole has a mild gravy but you can make a dry one as well called Pindi Chole. Combining the favorite street food of India, samosa, with the Punjabi classic gives us the delectable Chole Samosa Chaat. To serve this, lightly break the samosas in a bowl, pour the chole over it and top with basic chaat ingredients – curd, chilli powder and various chutneys. Serving chole with puri is so basic and can get quite boring some times. So to give it a new twist, you can serve the chole inside a leavened bread after baking it. Baked Chole Parcels will definitely impress whoever is eating them and ear you bonus points. This masala mix has a very unique flavor which can enhance the flavor of even the most basic dishes. There is a very common dish called Roti nu Shaak that is made in Gujarati homes which is made with leftover rotis. To this subzi you can add a little bit of chole masala to it a unique zesty flavor. Spinach and corn go hand in hand together, no matter what cuisine they are used in. Spicy Corn Palak is a simple Indian subzi which gets an intense flavor due to the added chole masala. Even though the subzi has other flavors of garlic and ginger in it, the chole masala ties it all together. 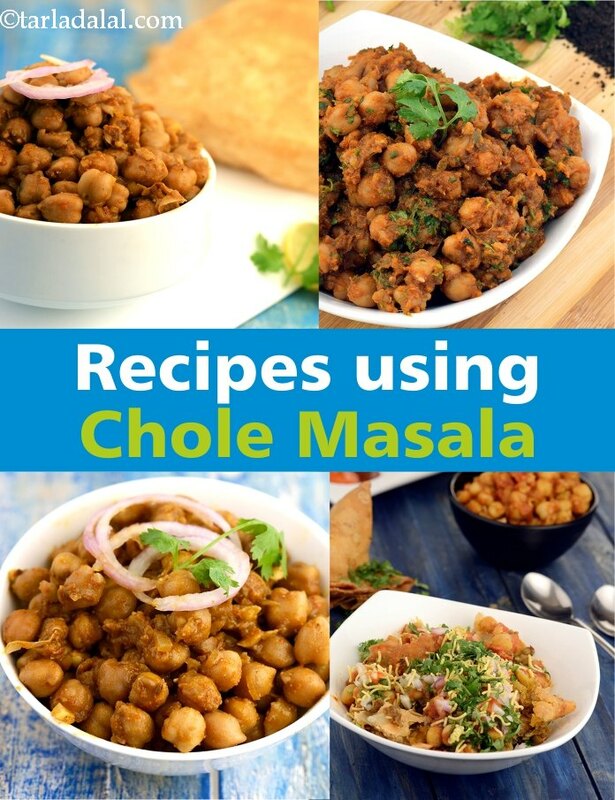 Hope you liked this collection of Chole Masala Recipes, Indian Chole Masala Recipes. Each mouthful of this wrap feels so complete, and is so satiating! hmmm… pindi chole topped with gajar ka achaar and onion rings and rolled up in a simple roti, this makes a wholesome snack by itself. A two-minute wrap when you have leftover chole in the refrigerator! Pindi chole, although this classic recipe is an indispensable part of any elaborate menu, making it can be quite tedious! not any more, thanks to the pressure cooker that makes this dish so easy and fast to make. Green peas take on a new avatar, forming the gravy for this innovative dish. Beware, the bowl will be empty even before you know it! A variation of a popular chole dish. This 'chatpata' treat should be accompanied with steaming hot puris. The chole masala imparts a zesty flavour to this dish, and is commonly available at most provision stores. Chole masala (jain) is a jain style chickpea preparation with choicest spices and ingredients. The kabuli chana or chole are boiled along with tea leaves tied in a muslin cloth and then cooked in a delicious spicy gravy. Serve chole masala(jain style) with roti or rice. Black chole is a nice variation to the typical chole or kabuli chana recipe cooked in traditional punjabi style. Here the boiled kabuli chana is cooked with onion, tomato, hole masala and tempered with curry leaves and ginger juliennes. Kaala chana or black chickpeas are cooked in a tasty recipe, kaal chana curry. An indian spicy recipe of chickpeas cooked in a tasty onion based gravy. Relish with fried breads(poories) or rice. The classic north indian dish full of indian spices. Serve with parathas or puris.